I woke up early this morning and remembered a small incident that took place a year ago. It was 6:45 on a Friday evening, and the weekend traffic had already built up feverishly in Central. 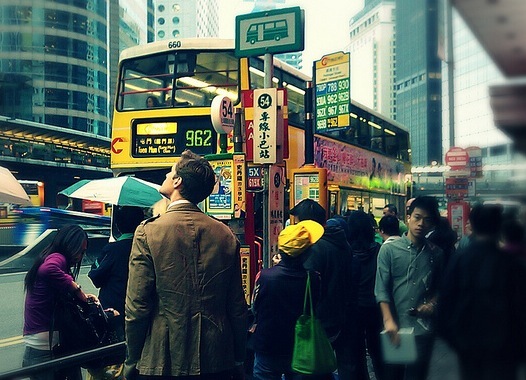 I got in line at the minibus stop outside the McDonalds on Connaught Road, eager to get home. People and vehicles were moving in every direction. Patience was in short supply. A half-dozen double-deckers all tried to dock at the same time, unable to outmaneuver each other and unwilling to give in. Car horns began to blare from behind, while frustrated passengers pointed at different vehicles to assign blame. It was a complete chaos. Then suddenly, a mounted traffic policeman came out of nowhere, blue lights flashing authoritatively on the side of his white motorcycle. I thought to myself: this is why I love Hong Kong. Barely two minutes into a traffic situation, the efficient Hong Kong police arrived on the scene, a white knight to the rescue. I was impressed. 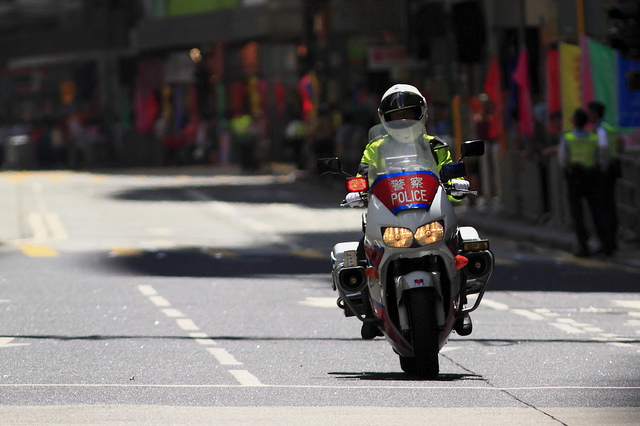 The policeman turned off the siren on his bike, dismounted and started waving his arm. But instead of directing traffic, he signaled for the buses to move to the side, like Moses parting the Red Sea. Soon after, a black Audi A8 came through the tunnel of double-deckers and pulled over not ten feet away from me. The door flung open and out came Financial Secretary John Tsang (曾俊華) flashing his signature mustached smile. He walked toward the office building next to McDonald’s, where he was received by several men in black suits. As soon as the coterie disappeared into the building, the Audi left. The traffic policeman got back on his motorcycle and drove off immediately, oblivious to the pandemonium he left behind. It was as if he didn't see any of us. In the next 15 to 20 minutes, the buses inched their way through the gridlock and the traffic jam eventually ran its course. During that time we were all left to our own devices. I was angry. 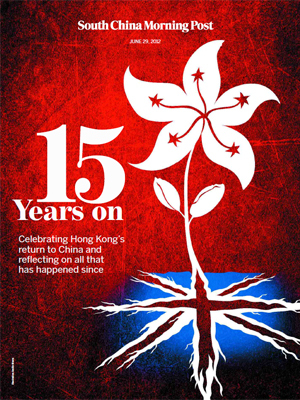 Today, Hong Kong celebrates the 15th anniversary of the Handover. To be more precise, our government celebrates the 15th anniversary of the Handover. 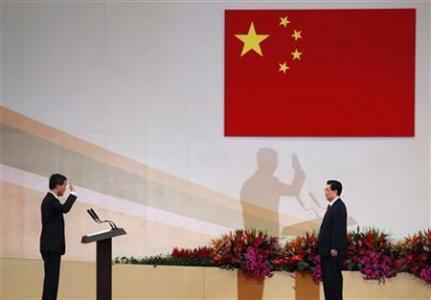 Chairman Hu Jintao (胡錦濤) arrived on Friday to kick off his three-day visit. 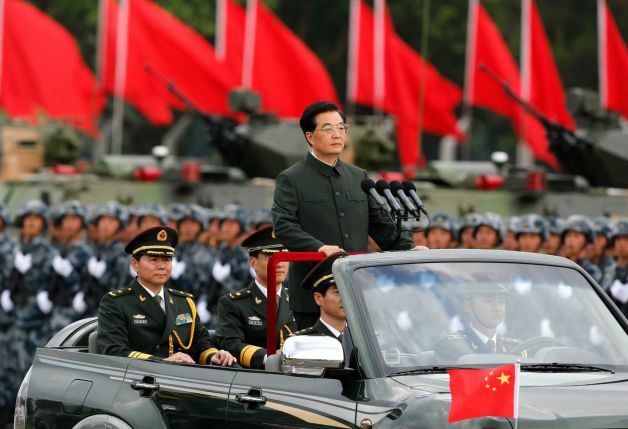 In a series of carefully choreographed press events, Hu saw model homes, inspected construction sites and reviewed the 3,000 People’s Liberation Army troops based in Shek Kong (石崗). The festivities culminated in a state dinner held last night at the Wanchai Exhibition Centre, attended by political leaders and business elite and entertained by local and Mainland celebrities in a garish variety show. It was a night of self-congratulations, when social climbing, political ambition and greed dissolved into one emphatic champagne toast, all under the benevolent eye of that feared and revered paramount leader. Just a stone’s throw away from the Exhibition Centre is Hennessey Road, the main route of today's rally organized by local advocacy groups. For the vast majority of the population, reverting to Chinese rule calls for lamentation, not celebration. And on every July 1, we take our lament to the street and spend the sweaty day in a million man march from Victoria Park to the government headquarters in Central. Frustration and resentment against the establishment have been festering for years and they erupt once a year on Handover Day. There are the usual calls for universal suffrage and complaints about high property prices and China’s human rights records. 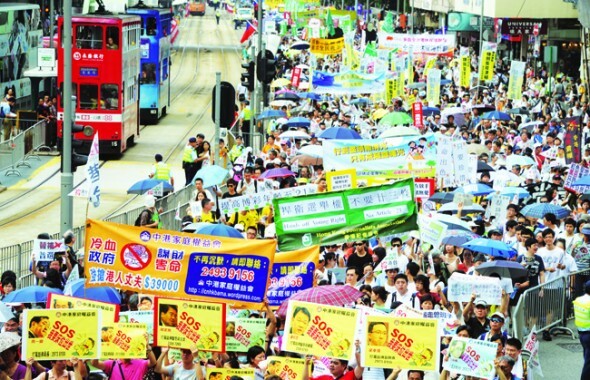 Protesters litter the streets with anti-government flyer, the heat of their collective grievances simmers the summer air. In the past week, every newspaper in the city has published its own look-back on the past 15 years. With watershed moments like the Asian Financial Crisis in 1997, the SARS outbreak in 2003 and the financial tsunami in 2008, there has been no shortage of materials for a compelling review. I too was tempted to write my own look-back piece to express my sentiment on the 15th anniversary. I could have cataloged the list of our achievements and failures on the rollercoaster ride since 1997 or launched another impassioned tirade against the many social injustices in our city. Instead, the whole day I kept thinking about that one trivial event I witnessed in Central a year ago. Strange, because the incident bears no relevance to what most Hong Kongers have on their minds today: the widening wealth gap, the economic dominance of property oligarchs and our civil liberties being eroded daily despite the “one country, two systems” promise from Beijing. I didn’t understand my fixation on that small anecdote until I turned on the television and saw a recap of Hu’s state visit in nauseating detail. Then it dawned on me that a common thread runs through that trivial incident in Central, the Handover celebrations and the state of Hong Kong 15 years on. More than ever before, there is a fundamental disconnect between our government and the general population. The few who govern the city – none of them chosen by us – go on with their business and we go on with our own. We are as invisible to the ruling elite as the gridlock traffic was to that unconcerned policeman. Without a mandate from the people, our government has a mind of its own and does things we never ask it to do: from organizing the lavish commemorative events this week to funding wasteful infrastructure projects, rolling out the brainwashing national education curriculum and clamping down on street protests with excessive police force. On the other hand, issues that we are asking our government to address, such as the growing income inequality and our economy's over-reliance on the financial industry, are left untouched. Under our tilted political system, where the chief executive and half the lawmakers are handpicked by the establishment, the government is increasingly out-of-touch, unaccountable and decoupled from the populace. It is as if we operate in two separate, very different worlds. The disconnect is a chilling reality that every citizen has accepted as part of our unique way of life. With C.Y. Leung’s leadership already stunted by his own duplicity and an uncooperative legislature, a realignment between what they do and what we want seems ever unlikely. And that is all I can think about on this 15th anniversary of the Handover.